We’d love your help. Let us know what’s wrong with this preview of The Philosophy of Neo-Noir by Mark T. Conard. To ask other readers questions about The Philosophy of Neo-Noir, please sign up. I personally feel that the selection of essays is somehow repetitive - most of them starts with an introduction to the transition from classic noir to neo-noir; and the analysis can be enriched by addition of critical gender and race studies, as well as the global connection of neo-noir cinema. 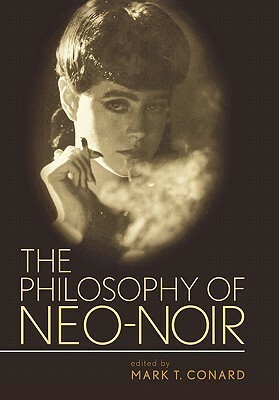 But overall The Philosophy of Neo-Noir is a decent introductory reading, especially its first part. The rich possibilities for describing difficult philosophical ideas through interplay and comparison with the narratives of a film genre are fully realised in this excellent collection of 13 essays, all written by academics, mostly either professors or assistant professors of Philosophy from various American universities. To describe all the essays would take too long, but if I had to pick one as exemplary it would be “Blade Runner and Sartre: The Boundaries of Humanity” by Judith Barad, a professor of philosophy and women’s studies at Indiana State University. Barad employs a close reading of the narrative of Blade Runner to delineate the ideas of Sartre. The correlation of Sartre’s ideas to the narrative of the film enriched both my comprehension of Sartre and my appreciation of a film I already loved very much. It’s not difficult to comprehend ideas such as the following: “Sartre counsels us that, when we choose, we should restrict our efforts to what is under our immediate control… Rather than focussing our energy on things beyond our control, we concentrate on what we can do. Deckard [the hero of Blade Runner] can’t save his society by himself, but it is within his power to save an individual.” (p.26). As with the other essays in this book, Barad’s close reading of, and respect for, the film’s narrative leads to some fascinating correlations. She notes, for example, in relation to Sartre’s “In order to get any truth about myself, I must have contact with another person” that, “Ironically, it’s only the replicants, who, through most of the film, display intersubjectivity by caring about each other. All the humans… live alone, without any apparent intimate relationship to anyone else.” (p.29). Elsewhere there is a very interesting categorising of Neo-Noir into three types- past, present and future – by Jerold J. Abrams, with a focus on identity, and the essays also look at some now almost forgotten Neo-Noir films (Dark City, A Simple Plan), exploring them from a philosophical framework. In some cases I enjoyed the essays more than the films they were about. If you want to learn what neo-noir is all about, read this book. One of the most educational books about film and philosophy ever crafted! I liked the volume on classic film noir better and think there were probably a lot more films that could have been written about but hey I'm no philosopher. Enjoyable (if very academic) reading. For a true cinephile, this book makes fascinating reading, as long as you don’t mind plowing through a bit of professorial language. The essays are broken down into three parts: Subjectivity, Knowledge, And Human Nature in Neo-Noir; Justice, Guilt and Redemption: Morality In Neo-Noir; and Elements Of Neo-Noir. Among the best of the bunch are the essays on Blade Runner, Memento, and the neo-noir antihero in Part One. They set the stage for what’s to come in the following parts. Much of what’s writt For a true cinephile, this book makes fascinating reading, as long as you don’t mind plowing through a bit of professorial language. Much of what’s written compares classic noir with modern day noir, in terms of how the paradigms and tropes of classic noir are updated, defied or self-consciously invoked. In Mark T. Conard’s study of Quentin Tarantino’s films and Reservoir Dogs in particular, Conard (citing Andrew Spicer) divides neo-noir into two camps: modernist and postmodern. Mark T. Conard lives in New York City (The Bronx!). He earned his Ph.D. in Philosophy from Temple University in Philadelphia. He’s the author of numerous essays, and is the co-editor of The Simpsons and Philosophy, and Woody Allen and Philosophy, both published by Open Court Press; and is editor of The Philosophy of Film Noir, The Philosophy of Neo-Noir, The Philosophy of Martin Scorsese, The Phil Mark T. Conard lives in New York City (The Bronx!). He earned his Ph.D. in Philosophy from Temple University in Philadelphia. He’s the author of numerous essays, and is the co-editor of The Simpsons and Philosophy, and Woody Allen and Philosophy, both published by Open Court Press; and is editor of The Philosophy of Film Noir, The Philosophy of Neo-Noir, The Philosophy of Martin Scorsese, The Philosophy of The Coen Brothers, and The Philosophy of Spike Lee (all published by The University Press of Kentucky). In addition, he’s the editor of Nietzsche and the Philosophers (Routledge, 2017). He plays in a blues band, listens to jazz, is known to drink bourbon, and occasionally enjoys fine cigars.